Your annual injection of autumn garden-love. Bring the fam for flowers & face-painting. A feel-good community event supporting our local kura. Come and enjoy the energy, get your gardening questions answered and make the most of our low prices. It’s the best time to be planting and we have thousands of healthy plants, going for a song. Eftpos is available at the office for cash on the day. Bring your own boxes, bags, and trays (although we’ll have some there). And a gold coin koha for delivery to your car for Paekākāriki Scouts. A great variety available, thanks to our tireless Potty Potters. Natives, perennials, herbs, winter veges & flowers! Our local garden experts will be wandering the sale area to answer your questions. Our cafe will be humming with tasty treats for brunch and lunch, the Barista Boys will keep you caffeinated, live music will be playing with stalls selling a range of local goods. Activities for the kids include: making miniature gardens, face painting, obstacle course, bouncy castle. Rain Day 19 May. 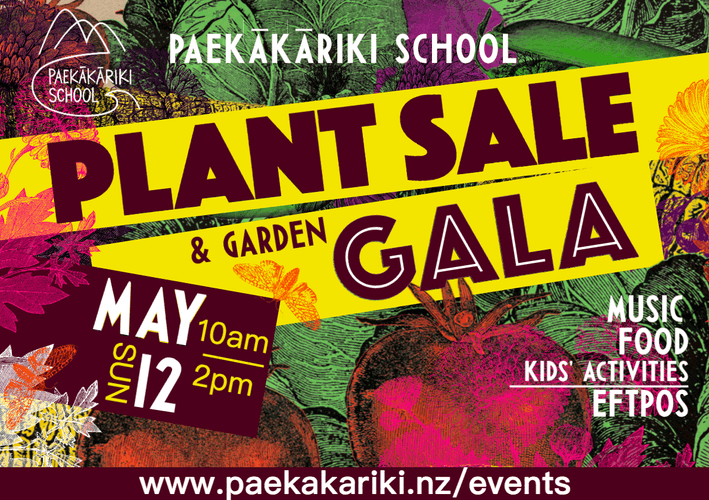 If the weather is dodgy check the Paekākāriki School Facebook page for notice of postponement.